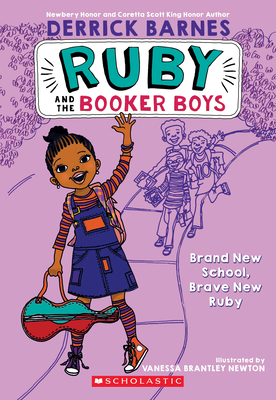 Brought to you by Newbery Honor author Derrick Barnes, eight-year-old Ruby Booker is the baby sis of Marcellus (11), Roosevelt (10), and Tyner (9), the most popular boys on Chill Brook Ave. When Ruby isn't hanging with her friend, Theresa Petticoat, she's finding out what kind of mischief her brothers are getting into. She's sweet and sassy and every bit as tough as her older siblings. She sings like nobody's business; she has a pet iguana named Lady Love; her favorite color is grape-jelly purple; and when she grows up, she's going to be the most famous woman animal doctor on the planet. She's the fabulous, oh-so-spectacular Ruby Marigold Booker! Derrick Barnes is the Newbery Honor author of Crown: An Ode to the Fresh Cut, as well as several other acclaimed books, including the Ruby and the Booker Boys series: Brand New School, Brave New Ruby; Trivia Queen, Third Grade Supreme; The Slumber Party Payback; and Ruby Flips for Attention. Derrick and his wife, Tinka, reside in Kansas City, MO, with their three sons. Illustrator Vanessa Brantley Newton trained at the Fashion School of Technology and the School of Visual Arts. She has illustrated many books for children, including Mister and Lady Day, One Love, and Let Freedom Sing. She and her husband live in Charlotte, North Carolina.